BELIZE CITY–The People’s United Party (PUP), yesterday afternoon at a National Executive meeting at their headquarters on Queen Street, removed Arthur Saldivar as the Party’s Belize Rural North standard-bearer. Party Leader Francis Fonseca made the announcement to the media, party supporters and other interested persons after the party had made the decision. The report of that investigative committee was delivered to Party Leader Fonseca on September 12, and the PUP national executive met today to consider Saldivar’s fate. While Fonseca would only say that the national executive of the party acted to remove Saldivar, he did not disclose any information from the party’s investigating committee. When asked by reporters, Fonseca said that the work of the investigating committee is for the party and is not for sharing with the public. Amandala also asked the PUP legal advisor, Senator Anthony Sylvestre, Jr., about the work of the investigating committee, but Sylvestre also told us that he could not comment on the work of the committee. Two weeks ago, the party set up an investigative committee to investigate certain allegations made against Saldivar that emerged in the media and had to do with his conduct as an attorney. On Wednesday, August 6, 2014, the story broke that Melonie Coye, a former client of Saldivar, whom he had defended for years in the country’s biggest money laundering case, made the allegation that Saldivar had taken almost one million dollars of her money, and had not returned it. Coye hired the law firm of Courtenay and Coye to recover the money from Saldivar. The letter then listed the members of the committee — Henry Usher, PUP chairman; Anthony Sylvestre Jr., the party’s legal advisor; Cassian Nunez, ODS member, Dangriga; and Armando Valdez, ODS member, Orange Walk. “(1) That you have in your possession over $900,000.00 plus of your client’s money (Melonie Coye), unauthorized. That your client, through her new attorney, Mr. Eamon Courtenay S.C., is demanding the return of the money or in default a civil claim to recover said sums. The information in possession of the Committee in this regard emerges from a copy of a letter from the law firm of Courtenay Coye LLP to you requesting the return of the said monies. This letter was accessed from news reports of Channel 5 and Channel 7. “(2) That you illegally entered home of Don Blunt and occupied the said premises. The information in this regard emerges from news reporting of this matter by Channel 5 and Channel 7. “1. Whether the alleged conducts (singularly or cumulatively) and your responses to them so far have or will tarnish your candidacy. “ 2. Whether the alleged conducts (singularly or cumulatively) and your response to them so far give the appearance that you have allowed your integrity to be called into question. If yes, what steps (if any) can be taken to mitigate the public appearance/impression. “3. Whether the alleged conducts (singularly or cumulatively) and your responses to them so far give the appearance that you have allowed your position as Standard Bearer for the BRN constituency and a member of the NE to be demeaned. If yes, what steps (if any) can be taken to mitigate the public appearance/impression. “4. Whether the alleged conducts (singularly or cumulatively) and your responses to them so far give the appearance that you have compromised the fair exercise of your function as a Standard Bearer and member of the NE. If yes, what steps (if any) can be taken to mitigate the public appearance/impression. “5. Whether any potential legal claims will impact your ability as Standard Bearer and member of the NE. The letter further acknowledged that the committee was aware that at that point the allegations were just that – allegations, and that no actual civil or criminal action had been lodged. “The Committee is also cognizant that you are on the ground in the BRN constituency working; you have a good team and machinery in place and the BRN constituency in terms of logistics is prepared for the next general elections, whenever it is called,” it conceded. The Chairman’s letter concludes: “But the NE under Article 13(3) Constitution, referred to in our prior correspondence, is charged with the organization and administration of the Party and shall have the power in an emergency to formulate a position. And this arises where matters that have the potential to be detrimental or prejudicial to the interest of the Party come to the attention of the National Executive. This the NE did on 27th August, 2014 and thus the appointment and convening of this Committee. The blame for Saldivar’s political fall has been put by Blease squarely at the feet of the party’s new national campaign manager, Godfrey Smith. While Saldivar appeared to shy away from blaming Smith directly, that was not the case with his public relations man, Blease, who was unsparing of Smith. Today, Thursday, Saldivar told Amandala that he thinks that Smith and Senator Lisa Shoman plotted against him for his anti-LGBT stance. In the UNIBAM challenge to Section 53 of the Criminal Code, Godfrey Smith, along with Shoman and the British attorney Lord Peter Goldsmith, defended Caleb Orozco, UNIBAM president. “My first reaction to it was simply to rise and leave. 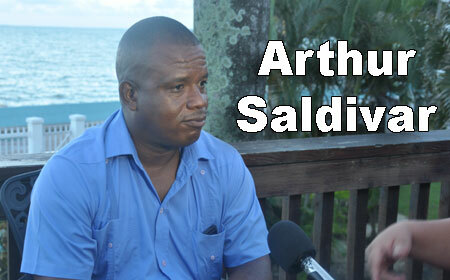 If that is the decision, then the party has abandoned me,” Saldivar declared. “From my understanding of things, the report of the committee was not contemplated; it was not even considered. Because in retrospect, in actuality, the report did not yield anything; there is nothing there,” he said. The woman whose name has been at the center of the controversy involving Saldivar, his former client Melonie Coye, has not made any public statement on the matter of the money Saldivar allegedly took from her. Saldivar also confirmed to Amandala that Coye did not speak to the PUP investigating committee, although they made attempts to speak to her.